Safe practices at work, home, and play can prevent many injuries, illnesses, and deaths. Once injury or sudden illness has occurred, effective first aid can be the difference between a rapid or prolonged recovery, a temporary or permanent disability, and even life or death. If that isn’t motivation enough to make sure that you, your family members and/or your employees are first aid and CPR/AED trained, wait until you read the statistics. The statistics for workplace and home injuries and deaths are alarming. * An incident can happen anywhere and to anyone. At work, injuries and illnesses kill about 2.2 million people in the world each year. Unintentional injury is the leading cause of death in the U.S. for individuals younger than 44 years of age. On average, 15 workers die each day in the U.S. from traumatic injuries. More than 4 million workers suffer a nonfatal injury or illness each year. In the U.S. about 1/3 of all injuries occur at home. In the U.S. about 20% of injury deaths occur at home. For every home injury death there are about 650 nonfatal home injuries. Having someone in your workplace or at home that is trained in first aid to deliver initial emergency procedures until EMS arrives can be the difference between life and death. Are you, someone from your family and/or your employees ready to respond in an emergency? 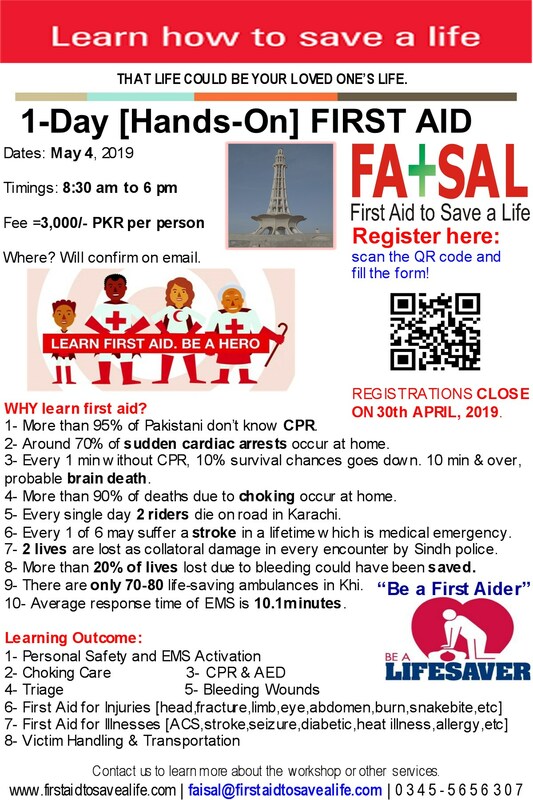 First Aid to Save a Life (FATSAL) Pakistan Instructors are ready to help you. You can find a class in Lahore, Islamabad, Karachi, Sialkot, Peshawar and Multan, or can arrange an in-house session for your community or at your workplace. Get trained and be prepared for an emergency. This entry was posted in First Aid CPR and AED and tagged accredited, Accredited first aid training companies, Accredited first aid training courses, Accredited first aid training courses in Asia, Accredited first aid training courses in Pakistan, accredited training programs, accredited trainings, adult first aid, advance first aid, AED, aed training, AHA approved first aid training courses, AHA approved training courses, american health and safety institute, american safety and health institute, ashi, automated external defibrillator, automated internal defibrillator, basic first aid, best hotels of hyderabad, companies from lahore, cost incurred on first aid, cost of training and sustainability, CPR, CPR and AED Workshops in Gujranwala, CPR and AED Workshops in Hyderabad, CPR and AED Workshops in Islamabad, CPR and AED Workshops in Islamabd, CPR and AED Workshops in Karachi, CPR and AED Workshops in Lahore, CPR and AED Workshops in Multan, CPR and AED Workshops in Pakistan, CPR and AED Workshops in Peshawar, CPR and AED Workshops in Sukkur, cpr and first aid training, CPR Cert, CPR Certification, cpr training, digital certificates, Digital tools, ehs trainings, emergency first aid, events planned in lahore, fatsal pakistan training program, first aid, first aid and cpr trainings, first aid and fire safety training courses in hyderabad, first aid and fire safety training courses in islamabad, first aid and fire safety training courses in karachi, first aid and fire safety training courses in lahore, first aid and fire safety training courses in multan, first aid and fire safety training courses in pakistan, first aid and fire safety training courses in peshawar, first aid and local laws requirements, first aid and regulatory requirements, first aid audit of location, first aid cpr and aed trainings, first aid for all, first aid for general industry, first aid for medical problems, first aid for oil and gas sector, first aid statistics, first aid statistics 2011, first aid statistics 2012, first aid statistics 2013, first aid statistics by WHO, first aid statistics by who for 2012, first aid statistics2010, first aid training, first aid training courses in hyderabad, First aid training courses in islamabad, first aid training courses in islambad, first aid training courses in karachi, first aid training courses in lahore, first aid training material, first aid trainings for Oil and Gas Companies, first aid trainings in Afghanistan, first aid trainings in Bangladesh, first aid trainings in Bhutan, first aid trainings in Damam, first aid trainings in Iran, first aid trainings in Jabel ALi, first aid trainings in KSA, first aid trainings in Oman, first aid trainings in Saudi, first aid trainings in Sharja, first aid trainings in Sri Lanka, first aid trainings in UAE, first aid trainings in UK, first aid trainings in USA, free training, free training courses, health and safety institute, home first aid, how to evaluate the benefits of training, how to prevent injuries, HSE, hse companies in peshawar, HSE courses in 2013, hse courses in hyderabad, HSE courses in pakistan, HSE services and training providers, HSE training courses in Hyderabad, HSE training courses in Hyderabad Pakistan, hse training courses in islamabad, hse training courses in karachi, hse training courses in lahore, HSE Training courses in pakistan, hse training courses in peshawar, HSI, injuries and first aid, islamabad, Karachi, khybar pakhtun khawa, KPK, Lahore, latest first aid training material, latest first aid training modules, medic, medic first aid, medic first aid international, medic first aid office in asia, medic first aid office in india, medic first aid office in islamabad, medic first aid office in jhelum, medic first aid office in lahore, medic first aid office in pakistan, medic first aid office in punjab, medical problems and first aid, MFA, Multan, occupational safety training institute pakistan, Pakistan first aid statistics, pakistani security companies, peshawar, peshawar kpk, rawalpindi, reduce paper, registered training courses, registered training program, return on investment and trainings, road traffic accidents and first aid, ROI, safety courses in hyderabad, safety training companies, safety training company, safety training institues from lahore, safety trainings, save environment, scene safety, securities companies, specific first aid topics, strategic compliance, sustainable business solutions, sustainable training solutions and first aid to save a life pakistan, TNA, training and consultancy companies from lahore, training companies from lahore, training courses, training courses in hyderabad, training need analysis, training providers, trainings, trainings and return on investment, trainings and ROI, trainings at no cost, trainings in peshawar, trauma and first aid, trauma first aid, upcoming aed trainings, upcoming cpr trainings, upcoming first aid training courses, upcoming first aid trainings, upcoming trainings, USA first aid statistics, what i first aid, what is new, wilderness first aid. Bookmark the permalink.